In the Q&A after my talks I’m often asked, “How do we deal with uncertainty?” Andy Revkin had an excellent post on this on Thursday about Rachel Carson’s approach to uncertainty presented in a powerful study from Walker and Walsh celebrating the 50th anniversary of the publication of, “Silent Spring.” The answer I have always given audiences about uncertainty is that you need to be very, very careful about it. This study says the same thing, saying you need to “strategically” manage it. What do climate skeptics have in common with this goddess of the environmental movement? It’s really a fascinating article that Andy Revkin brought to his audience’s attention on Thursday with this blog post. 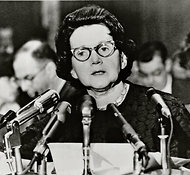 In honor of the 50 year anniversary of the publication of Rachael Carson’s landmark book, “Silent Spring.” He points to a recent article by two researchers of rhetoric who basically say Rachel Carson used a lot of the same logic that today’s climate skeptics (and ozone skeptics and vaccination skeptics and cigarette smoking skeptics) use. As Naomi Oreskes and Erik M. Conway told about in their book, “Merchants of Doubt,” the skeptics have perfected the art of “doubt casting.” They’ve refined the ability to attack entire institutions of thought simply by asking the question of, “How can we be sure?” over and over again. The data say the climate is going to get very warm. Yes, the climate skeptics reply, but you’re not 100% certain about that — so we should be careful about acting if we’re not sure of things. The two researchers examined Rachel Carson’s detailed notes for her book and found the same form of logic — casting doubt on everything the pesticide makers said, talking about both ignorance and uncertainty, ultimately saying we can’t be certain these poisons aren’t poisoning us, so we should be careful of their use. The bottom line, which is a little unsettling is: doubt casting on pesticide producers = good, doubt casting on climate scientists = bad.